This ‘Tale of Two Dorothys’ portrays William Wordsworth’s sister at different stages in her life. A scuttle such as Heaney describes in the piece still sits next to the hearth at the Wordsworths’ Dove Cottage at Grasmere in the English Lake District. The first Dorothy young, energetically poking and raking the grate (jig-jigging her iron shovel) with tetchy, noisy determination (barracking a pile of lumpy coals). The man with the appropriate name (Thomas Ashburner) lived in a cottage opposite Dove Cottage and did odd jobs for her including coal delivery. Dorothy is indifferent to what is going on around her, wracked with pain (her toothache ablaze), a condition aggravated by the stoking process (every jolt and jag) as if a dagger backstabs her in her every joint. The second Dorothy old, mentally and physically frail (doting), her age reflected in the flicker in a brass companion-set), alone now – all the companions gone or let go, some dead, some left behind. Dorothy no longer hears or expects the sound of company arriving (footfalls on the road), where once the sounds of social gathering were as copious (plump) as the depth of her hospitality (the dropping shut of the flap-board scuttle-lid) as it banged shut after she heaped coal onto the open fire: stacked the grate for their arrival. Dorothy Wordsworth (1771-1855) joins the list of the collection’s celebrated names: she was the devoted sister of William Wordsworth, who kept house for him in their native Lake District; she was left on her own after his marriage but kept ‘the home fires burning’ in his absence. In our times of instant heating, it is difficult to appreciate that keeping warm in days gone by involved coal and coke, dust, mess and hard work. In this piece the hearth is the central feature and unifying factor. The epigraph is from Auden’s poem ‘The Shield of Achilles’ (1952). 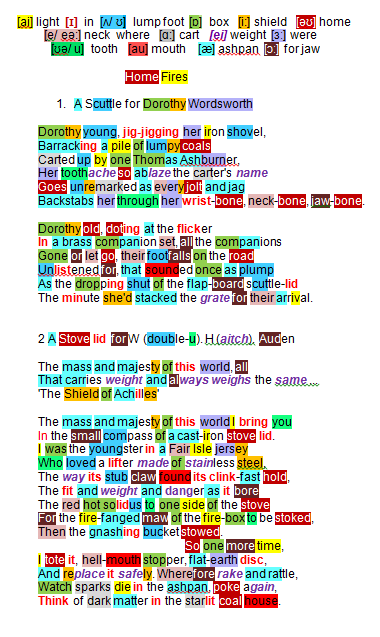 Heaney is not, however, exploring the rejection of war-related violence of the Auden poem – rather, visual memory of an old style decorated cast-iron stove lid, untouchable because burning hot, has triggered a link in his mind to the epic world of Homer’s Iliad and the decorated shield fashioned for a classical hero by a divine. Both epigraph and sonnet focus on mass and majesty – different contexts with a shared significance that seems, to Heaney, to corroborate Auden’s view of all that carries weight and always weighs the same. The classical warrior’s round shield is replaced by Heaney’s small-world icon, similarly round in shape, of concentric circular design, hefty and too hot to handle – a humble domestic object from the past: the small compass of a cast-iron stove lid. The boy who once stood next to the stove (the youngster in a Fair Isle jersey) loved the procedure: the lifting tool that removed the lid by grasping it (stub claw), held it fast with a click-fit sound (clink-fast hold) that reassured the handler … the safety concerns (fit and weight and danger) as the magma that became clinker(red hot solidus) was pushed to one side so that fuel could be fed through the hellish open mouth (fire-fanged maw of the fire-box) … finally the gnashing bucket (he recalls the tooth-grinding sound as coal/coke was propelled by shakes into the fire-box) returned to its place. His daily routine (one more time)… to safely replace the weighty (tote) stove-lid that shielded him from the stove’s infernal interior (hell-mouth stopper) a mundane flat-earth disc with majesty beyond its mass. Heaney invites himself to revisit (poke again) the sounds (rake and rattle), light effects (sparks die) and emotional memories of a long-lost time – cherished (starlit ) times when fetching in coal (dark matter) from a separate building was also part of the routine. Auden was a 20c British poet, playwright and critic who adopted American citizenship in 1945. He was often torn between his privileged background and his left-wing political sympathies.